The Korean Holly Fern is a very compact and neat fern which remains evergreen with us, having bi-pinnate dark green fronds with black veins. The fronds have holly like tips and the scales are silvery-white. This lovely fern forms neat clumps in moist but well drained, acidic soil and can also be grown successfully as a houseplant. It is excellent in shady spots or amongst rocks in a shaded rock garden. It is also often used in flower arrangements and by florists for corsage work. AGM. Hardiness rating H6. 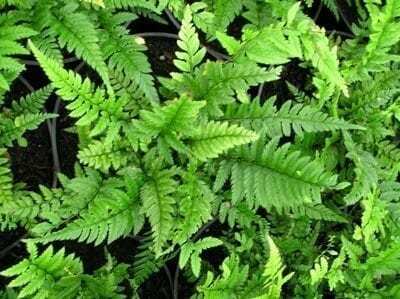 Tidy any fronds damaged during winter in ealy spring, which is also the best time to divide this fern. It can also be raised from spores.